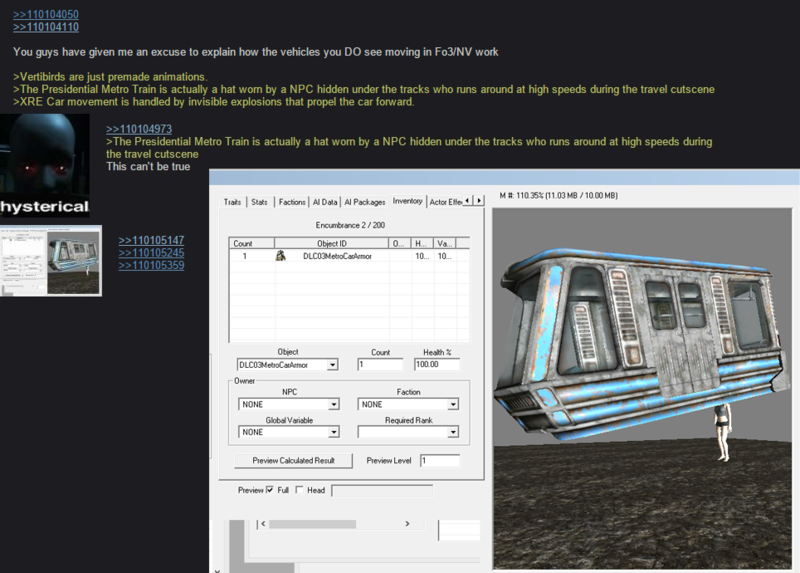 Yesterday, via 4chan, the internet enjoyed the story of how Fallout 3: Broken Steel's Presidential Metro car worked. The train, it was said, was actually a hat worn by an NPC who would run beneath the level upon activation—thus neatly faking the appearance of a working rail system. A good story, and one we posted about, but it's not exactly correct. I spent the morning tinkering with Fallout 3's editor, GECK, only to discover that the truth is also pretty silly. 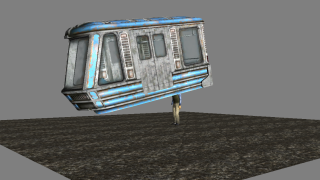 The moving Metro cab is an item in Broken Steel called 'DLC03MetroCarArmor'. It's not a hat, but rather an arm piece. Below, you can see Rivet City's Abraham Washington* wearing it. There, in the bottom picture, you can see that his right hand is missing. That's because the Metro cab is his right hand. Videogames! More significantly, it's not an NPC that powers the train. It's the player. After repairing the train, the player gets in and turns it on. This activates a script that equips the item and activates a package called 'DLC03MetroCameraPackage'. 'DLC03MetroCameraPackage' plays an animation called 'LooseDLC03MetroCamera'. In motion, that animation is pure gif gold. Incidentally, I'm not sure why running the animation in GECK causes the train car to flip sideways. Clearly that doesn't happen in the game. The route Washington takes above does map to the route you take in the game, however. There you have it. Without access to Fallout 3's editor, you'd never know this was what was happening behind the scenes. Which, after all, is the whole point of an ingenious workaround to an engine limitation. If it works, it works. *Why Abraham Washington? Partly because that's a very presidential name, which is fitting for a Presidential Metro. Mostly, though, because, as an Abraham, he's top of Fallout 3's NPC list. I am quite lazy.